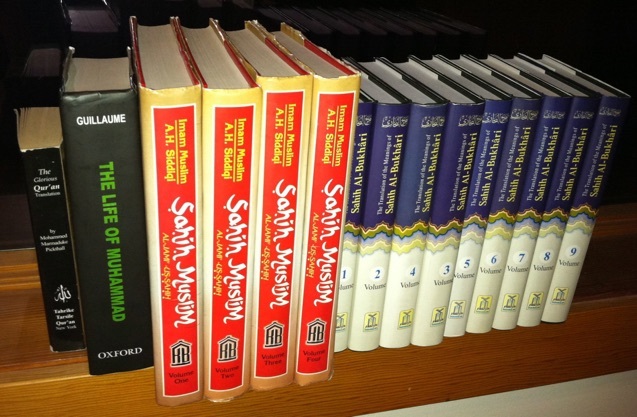 The most important books for Sunni’s (roughly 90% of Muslims) are pictured left to right: the Koran, the oldest biography of Muhammad or Sira, and the 2 most “reliable” hadith collections - 4 volume Sahih Muslim, and 9 volume Sahih Bukhari. A few other ‘reliable’ collections are named below. Sharia law amounts to the interpretations of qualified jurists over the centuries primarily about what is in these books and they quote from them to back up their opionions. Shia use the same Koran and other hadith, but the difference regarding Islamic supremacism is not important here. • Muslims say Allah is the only one who speaks in the Koran, Muhammad does not. It’s Allah’s instructions to his messenger Muhammad and to Muslims. "The Qur'an is the speech of God uncreated, the acts of men are created, and inquiry into the matter is heresy." • Muslims say because there are no variations of it in Arabic, unlike the bible, and the fact that Mohammad was illiterate (K-7:158) and so incapable of making it up, proves the book is a perfect copy of the uncreated “Mother of the Book” (K-13:39, 43:4) that has lived forever with Allah, and it “is not such as can be produced by other than Allah.” (K-10:37). Revealed “in slow well arranged stages, gradually” (K-25:32) from 610 AD until he died in 632. • According to orthodox Islam, Muslims shouldn’t touch it unless they are in a state of ritual purity, and non muslims should not touch it at all (Reliance of the Traveller e8.1, e8.3) except under extreme exception like MP’s in Guantanamo with “clean gloves” and handled “as if it were a fragile piece of delicate art.” DOD document, items 3b, 4a, and 4b. • Some Muslims do not believe the Koran is eternal and uncreated, which has great implications for how flexibly it can be interpreted. The Mu’tazilite teaching that was made state doctrine of the Abbasid Caliphate by Caliph al-Ma’mun (813-833) said it was created and promoted reason rather than blind faith in the Koran. This difference was a big problem, and 3 caliphs later Caliph al-Mutawalkil (847-861) crushed the movement, declared its heresy, and claiming the Koran was created became a capital offense. Scholarly consensus has accepted the ‘uncreated’ version ever since, though the punishment has varied in different Muslim cultures and times. An example of how serious some still take this is when Suliman Bashear, a West Bank professor at U. of Nablus, was thrown out a second story window by his students because he suggested the Koran was created over time. His German colleague uses the pseudonym Christoph Luxenberg, and is a leading scholar of ancient semitic languages investigating the historical origins of the Koran. In 1972 a huge cache of the oldest known manuscripts of the Koran were found in Yemen that differ from the current version which puts in doubt the ‘perfect copy of the uncreated Mother of the book’ idea. Here is more on this discovery and its implications, and here is a summary of the historical record about the origins of Islam from Did Muhammad Exist?. “Muslims in general have a tendency to disarm any criticisms of Islam and in particular the Koran by asking if the critic has read the Koran in the original Arabic, as though all the difficulties of their Sacred Text will somehow disappear once the reader has mastered the holy language and has direct experience, aural and visual, of the very words of God, to which no translation can do justice. • To be sure there’s no “deliberate tampering”, this site uses the same Koran translations the Muslim Student’s Association (MSA) uses on their various websites. One is pictured above, by Pickthal. • If you read the Koran on your own, there are at least 3 things you would need to know to understand it the way orthodox Islam does. 1) Except the first very short chapter (or sura), it is arranged more or less from longest to shortest chapter, not chronologically or by topic. Chronological listings of the Koran’s chapters can be seen here. 2) Islamic scholars say, and the Koran says (K- 2:106, 13:39, 16:101) that contradictions in the Koran exist, and some verses were abrogated by some of the later more intolerant Medinan verses. There is disagreement on exactly which verses have been abrogated by which verses, leading to a science in itself. But all the orthodox schools agree abrogation exists, for example as explained by al-Zanjani in The History of the Quran. Note that according to the Islamic calendar, Islam was not born on Muhammad’s birthday, or the day he died, or the day of his first revelation in 610, but in 622 when Muhammad and other Muslims migrated to Medina, when the verses became more intolerant and he became a political and military leader. 3) The 5 orthodox schools agree the Koran cannot be fully understood without the hadith, which are the words and deeds of Muhammad, even though Shiite and Sunni disagree on which hadith to use. There are Efforts to Reform Islam that want to only refer to the Koran and not use the hadith, which might be an interesting idea, but it has virtually no acceptance anywhere. • The Muslim Student’s Association (MSA) has the same 2 hadith collections and translations pictured above at their USC CMJE website, and are used for this site so there is no “deliberate tampering”. Sahih Bukhari - by Ibn Ismail al-Bukhari (810-870), 9 volume set, translator Khan. Often called Bukhari. Sahih Muslim - by Muslim al-Qushayri (821-875), 4 volume set, translator Siddiqi. Often called Muslim. • In Bukhari or Muslim, in the beginning of each ahadith it says who “narrated” the story, and whether he personally witnessed something Muhammad said or did, or who told him, which determines its reliability. • The Koran says Allah’s messenger is “an excellent model of conduct” (K-33:21) to follow. That he demonstrates “an exalted standard of character” (K-68:4), and “he who obeys the Messenger, obeys Allah” (K-4:80). Here are 20 more: 3:32, 3:132, 4:13, 4:59, 4:69, 5:92, 8:1, 8:20, 8:46, 9:71, 24:47, 24:51, 24:52, 24:54, 24:56, 33:33, 47:33, 49:14, 58:13, 64:12). So what did Muhammad say and do? It’s in the hadith. A great example of how much Newspeak™ terms are being used to distort perceptions is in the discussions about how Lone Wolfs™ got Radicalized™. As you are about to see, when devout Muslims copy Muhammad’s words and deeds as described in the Core Texts they become what is called Radicalized™. But how Radical™ is that if that is what devout Muslims are supposed to do? 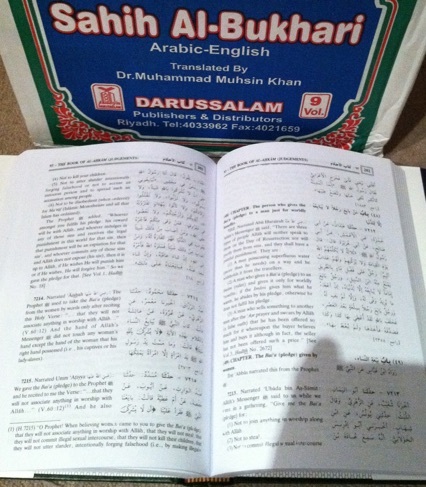 Sunan Abu Dawud - by Abu Dawud a-Sijistani (d. 888), 5 volume set, from MSA. Sunan Al-Tirmidhi - by Muhammad Al-Tirmidhi (d. 893) 6 volume set. Muwatta Malik by Imam Malik (715-801) from MSA. • The Life of Muhammad (Sira) by Ibn Ishak (around 704-773) translator Guillaume - oldest biography of Muhammad, AKA the Sira, that first appeared over 125 years after Mohammad died in 632. Original copy of the book was lost, it exists today in a revised version by Ibn Hisham who died in 834, with other parts quoted by early Muslims like Tabari (839-923). The reliability of legal issues covered in it have been questioned by some Muslim authorities, but as a historical guide about Muhammad’s life it is considered sound, and Bukhari and Muslim both used some of his hadith in their collections.